This photo was taken in the home of Kath and Bill West, their children were Sheila and John. I am sitting on the lap of Phil Berry (big bow in my hair). Next to me is John West (I think) on his mum’s lap. I recognise Tina and Daphne in the matching fairisle cardigans. Can anybody put any more names to this photograph? If you can, please leave a comment below. The second row from the bottom. The third lad in from the left, next to the lad who is looking away is Raymond Westcott. He was in my class at Finsbury Road school and he lived in Dinapore Street off Southover Street. Unfortunately I have just learned he has since past on, I do not know any of the details. Was this picture taken at 94a Springfield Rd? If it was we lived upstairs, top flat at that time. Mary Gillespie Smith. Yes, I think it would be 94. I remember you, Mary and your sister Bridget. The photograph was taken in 114 Springfield Road (not 94A). Kath and Bill’s children were Sheila and Brian West (me). There was no John in our immediate family. I am sitting on the right-hand side of Mum’s lap and my sister Sheila is three down from me on my right. Although I have not lived in Brighton since I left to go Liverpool University and have spent most of my time in Upminster, East London, I still get down to see the Albion play – or should I say the Seagulls?. I see a lot more of some of my cousins since my son and his family moved to Saltdean. 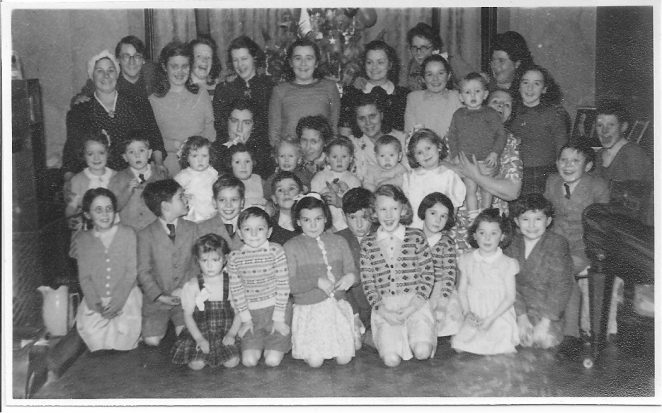 Along with some of my cousins we have identified some of the people in the in the photograph and will continue to try to identify others. Sorry Brian for calling you John. I do remember now.